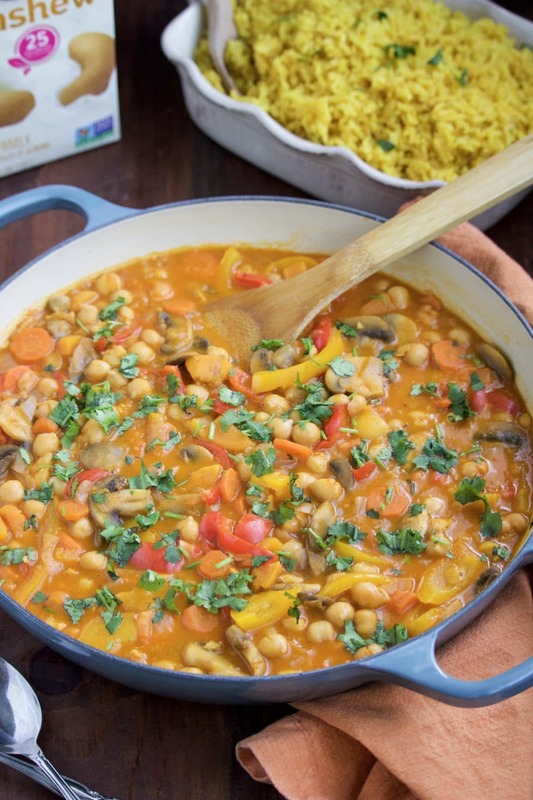 Spicy red curry chickpeas with veggies is a healthy, protein loaded dish with a creamy cashew milk sauce that packs a spicy punch with every bite! Dairy-free, gluten-free, and vegan. I can’t believe that January is almost over! Don’t stress out about the wedding – So far, I’m not doing so great with that. It’s less than one month away and I’m freaking out about every little detail that’s not done yet! Add more healthy vegan meals into our monthly menu rotation – I’m doing great with this one! Last week I made roasted cauliflower and tofu tacos….yum! Walk more – Travis and I both want to continue getting up early so we can get our exercise in for the day. To be honest, we haven’t done so great with this one but we’re working on it. Overall, I’m doing okay so far but I want to do better across the board. In October, Travis and I started getting up early and walking around our neighborhood for about 30 minutes. It was great, it made me feel refreshed, energized and ready to kick start the day! I also felt like I didn’t get tired in the afternoon. You know, the dreaded afternoon slump! Ugh. I feel like I get it even worse now that I work from my computer and I’m not up and about moving around. Start the day off with a walk around the neighborhood. Or if you don’t like walking by yourself, jog a few laps inside your house. (I’m not joking, I really do this!) If you can’t exercise in the morning, go in the afternoon when you start dragging. The vitamin d boost will wake you right up! Turn on some upbeat music! I do this every day! Meghan Trainor is my go-to music when I need to put some pep in my step. I like to dance around the house and it really helps to increase my energy. Take a power nap. Yes, I said go to sleep! According to Dr. Oz, if you drink a cup of coffee and then take a 20 minute nap, you’ll wake up super energized! Coffee takes about 20 minutes to kick in so by napping while the coffee is taking effect, it’s like you’re giving your body a double whammy of energy! Eat a healthy snack. If you’re still feeling sleepy after exercising, coffee and a nap, you might just be hungry. Don’t eat empty calories, make sure you eat something nutritious to give your body fuel. I love snacking on our favorite loaded granola bites or making avocado toast. Start dinner early. When I have a big dinner planned, it sometimes feels like all the prep work is hanging over my head and weighing me down. In that case, I’ll start dinner earlier than normal (start prepping the veggies or making the bread dough) so I can look forward to just relaxing at night. It might be mind over matter, but it seems to help me be less anxious about what I have to get done that day and I get more energized as I check things off my list. Today, I followed step #5 and made dinner earlier in the day so I could get it out of the way and just relax with Travis tonight. In an attempt to keep working on my second resolution, I added another vegan recipe to my recipe box last night! We had spicy Thai red curry chickpeas and vegetables over yellow rice. I’ll share the secret to my yellow rice with you in just a bit! If you like an extra thick sauce, add a teaspoon of cornstarch and mix it until you get the desired consistency. Or if you like the sauce to be thinner, add an additional 1/4 cup (or more) of vegetable broth until you’re happy with the consistency. Tip – For vegan meals, I like to add chickpeas to boost the protein in the dish. There’s something about cooked chickpeas, they get a delicious buttery texture that I just love! If you’re not vegan, you could easily replace the chickpeas with chicken. I always keep a few jars of red curry paste in the pantry just in case one of my dishes needs a spicy kick. Just a few tablespoons of the paste goes such a long way, it’s very flavorful! I use it in soups, sauces, and spread it on paninis. For this red curry chickpeas and vegetable dish, I mixed the red curry paste with vegetable stock and creamy Silk cashew milk (or coconut milk) to make a super creamy spicy sauce! It’s a family favorite and I make it at least once a month. Why We Drink Nut Milk and Why You Should Too! Travis and I have been exclusively drinking nut milk now for over two years. I don’t miss dairy milk at all, and I honestly prefer nut milk because of how flavorful, creamy, and smooth it is. Did you know that the Silk Cashew milk I used to make the sauce for this recipe has fewer calories than regular dairy skim milk?! Shocking, I know! I also use Silk almond milk creamer from Walmart for my coffee every morning and almond and coconut milk regularly for many of my recipes. It’s so easy to swap out dairy milk for nut milks, you really can’t tell the difference. Almond milk – Is plant-based, it has a slightly nutty taste, no cholesterol, and no saturated fat. Coconut milk – Also has a mild nutty taste, it’s only 80 calories per cup, and it has 50% more calcium Han dairy milk. Cashew milk – Is extra creamy and smooth, and has less calories than regular dairy skim milk! I use nut milk in my cereal, to make oatmeal, sauces, soups, chicken dishes, smoothies, and baked goodies. I often use them interchangeably too. 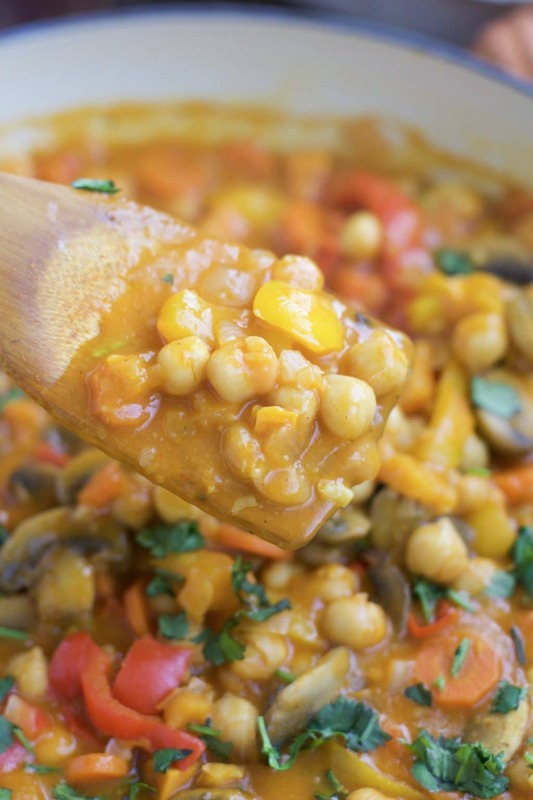 Like, with this red curry chickpeas and vegetables recipe, you could use any of the Silk nut milk and have delicious results. If one of your goals (like me) for the new year is to eat healthier and live a better lifestyle by consuming less dairy and more wholesome plant-based products, you should definitely give Silk milk a try. Keep an eye open for the new packaging coming in late January. Let me know which variety is your favorite! I love rice, I could eat a big bowl of plain white rice right now! When I was little, my mom would be making dinner and I would wait until she wasn’t looking so I could sneak spoonfuls of yellow rice out of the pot on the stove. Over the years, I’ve realized that brown rice is a much better healthier option so I switched to making that for most of my recipes. Plain brown rice is fine, it’s delicious but it just looks boring. Did you know that if you add 1/4 tsp of cumin, paprika, and turmeric plus a pinch of salt and pepper (for every 1 cup of rice) to the boiling water that the rice will absorb the color and turn the most beautiful shade of golden yellow once cooked?! Of course, you could use a box mix or saffron to turn the rice yellow. However, I like to cook from scratch, so no box mixes for me and saffron is expensive! I almost always have turmeric, paprika, and cumin in my spice collection. It’s easy, affordable and so much prettier to look at. You know you eat with your eyes first! 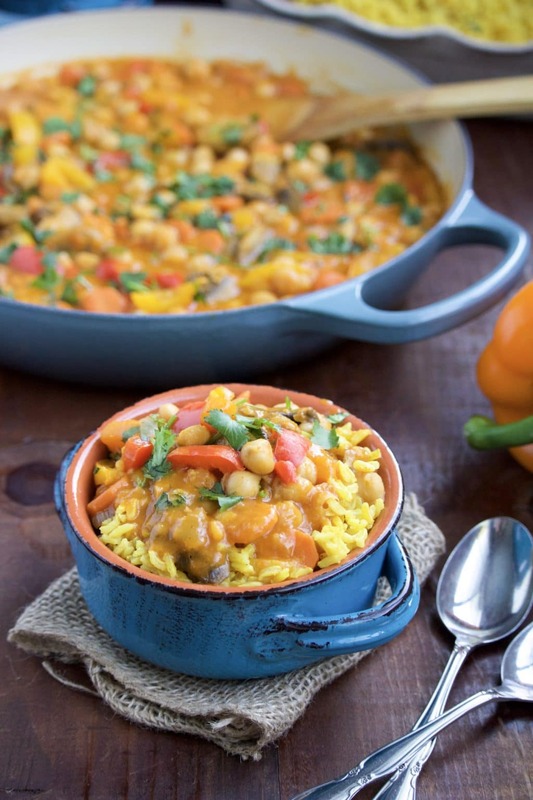 I served the red curry chickpeas and vegetables over the yellow rice for dinner last night, we both loved it! 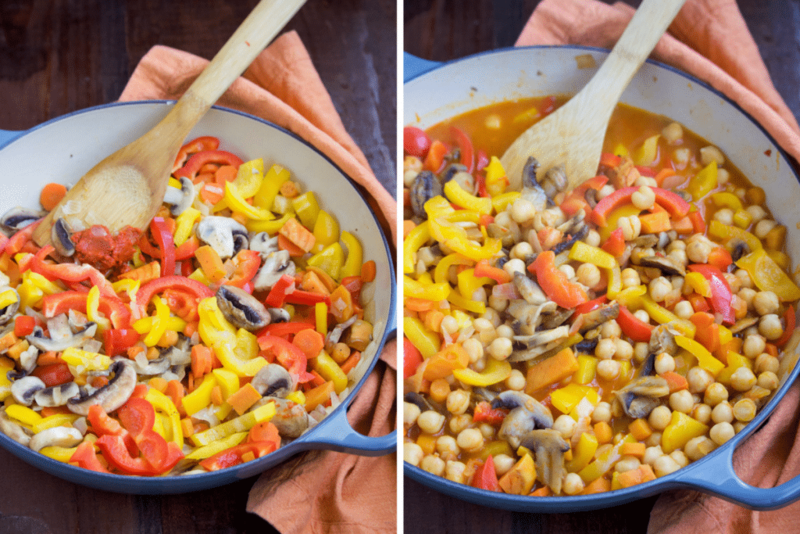 Spicy red curry chickpeas and vegetables is a healthy, protein loaded dish with a creamy cashew milk sauce that packs a spicy punch with every bite! Dairy-free, gluten-free, and vegan. In a large pan, sauté onions, peppers, and mushrooms in olive oil over medium heat for 5-8 minutes. Add the garlic, curry powder, red curry paste, salt, and pepper. Cook for 1 minute to let the flavors meld. Add the sweet potato, carrots, and chickpeas. Mix to coat the veggies in the paste. Add the vegetable broth, stir and cover. Bring it to a simmer then reduce the heat to low and cook for 10-15 minutes, or until sweet potatoes and carrots are tender and can easily be pierced with a fork. Stir in the cashew or coconut milk. Cook for 5-10 minutes to let the flavors meld. Serve over yellow rice and garnish with cilantro and a squeeze of fresh lime juice. If you want it to be extra spicy, add 1/4 tsp cayenne pepper. If you make this red curry chickpeas and vegetable dish for dinner and post a picture on Instagram, please tag me using the hashtag #StaceyHomemaker so I can see your delicious creation!